A popular choice for families, this large BMW model has a reputation for being a large luxury car that sits well next to the likes of Range Rover. 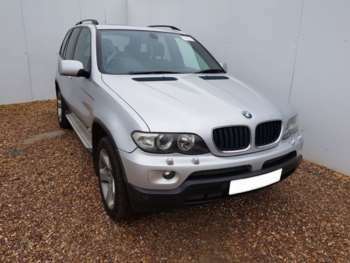 This car has sold so well over the years meaning there is an array of used BMW X5s for you to choose from on the used car market. There is plenty of room in a second-hand BMW X5, while the interior feels luxurious and comfortable. You’ll get everything you’d expect from a luxury 4x4 including traction control, cruise control, ABS and a great stereo. The X5 is packed to the rafters! With supportive seats and plenty of leg room, there’s not much not to love about these cars. A used BMW X5 also means you won’t break the bank and what more could you possibly want? The BMW X5 has all the drivability of a high-class saloon car but incorporates spaciousness and safety, making it a real driver’s dream. BMW has always been about driving experience and this model is no exception. You can enjoy high-performance capabilities and speed. There is hardly any body roll on the bends, which is pretty impressive too. It literally drives like a car, and although that’s not the obvious compliments, it should definitely be taken as one.